Fish finders used to be a dream to average fishermen a few decades ago. Today, they are highly accessible to anyone who wants to up their fishing experiences. With so many options out there, it could be challenging to find the right one, especially if you tend to get confused by tech details. 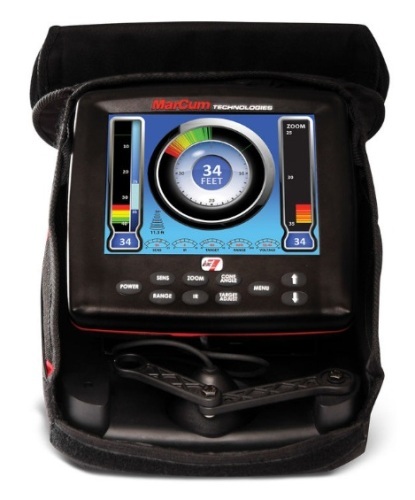 Go through this detailed Marcum LX-7 review for more information on one of the top rated units in the fishing business. This article will also cover how to choose a good fish finder. Here's a quick recap on what we think about this fish finder. 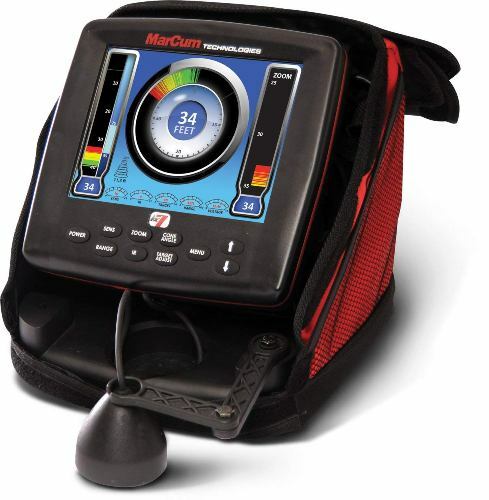 Known as a top of the line fish finder from this manufacturer, Marcum LX7 will impress with multiple aspects, such as the technologies used and its design. 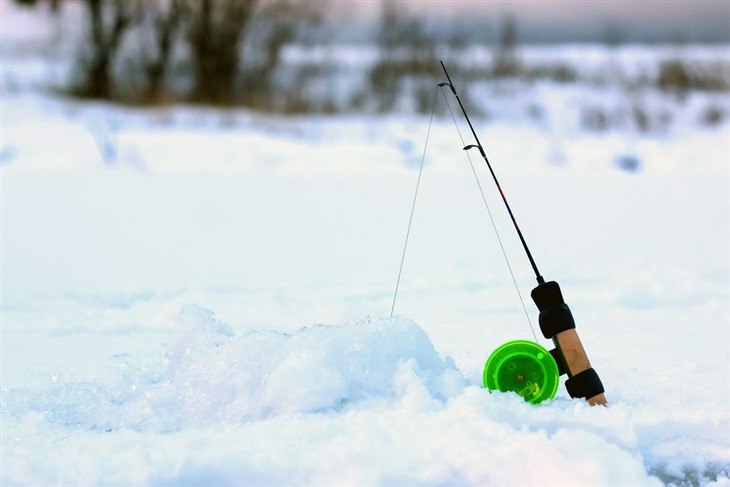 It has certainly improved the idea of ice fishing, while interactivity is probably the best word to describe it. According to pretty much every Marcum LX-7 review, the panoramic LCD display is one of its top features. It comes with a maximum resolution of 800 x 600 pixels and measures 8 inches. Images are extremely clear and sharp. You have four color palettes to choose from. Also, you are free to adjust it yourself, yet you can also select the automatic setting – no extra work required. The backlight is highly adjustable too – ideal to preserve battery. When set at 50%, you should get around 15 hours of battery life. All in all, the backlight feature is excellent for early fishing trips while the sun is still down. The battery has an impressive life for its size. It is a rechargeable 12V model. The charger cord is included in the package and allows multiple charging options. This is probably the only aspect you have to consider once you receive your fish finder. This unit can be used out of the box, as long as you spend a few hours to charge the battery upfront. No separate purchases are required. 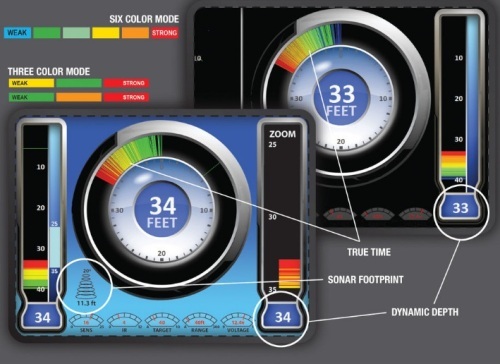 The sonar is extremely powerful and allows an almost instant generation of what is under your boat. You benefit from real time imaging – less than 0.2 seconds for accurate displays on the screen. Given the peak to peak power (4,800 watts), the sonar can go down to maximum 300 feet. It relies on a modern Sonar Footprint Technology for more accuracy. With ½ inch target separation, making the difference between two objects as two targets has never been easier. In other words, you will have no problems spotting a fish swimming close to a natural structure. You will also be able to tell whether you are looking at one or two fish. In need of more detail? Zoom in on the info for more details. The transducer should never be overlooked when looking for a fish finder. 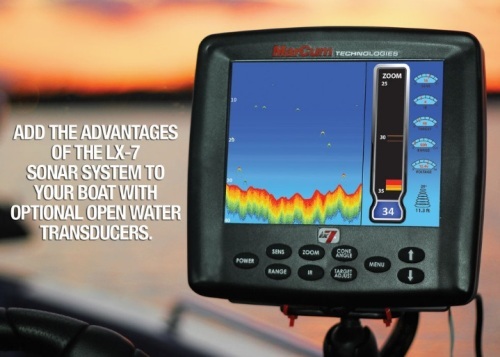 The Marcum LX7 transducer is a dual beam model. You can choose to watch the surroundings in an 8 degree angle or a 20 degree angle. Imaging is captured right under the transducer. Unlike other high end models, this one does not come with side imaging. Also, it does not capture forward imaging. Although some might say these are some of its drawbacks, the truth is the transducer is excellent for ice fishing. It is quite efficient in boat fishing too if you are a beginner. There are quite a few good settings to play with for a more individualized experience. While checking the display out, you will have all the settings available in a straightforward dashboard – gain, target adjustments, digital depth, range, battery voltage and so on. The display can be customized, as well as the graphs – whatever seems easier for you. Apart from customizing the brightness, you can deal with the range, colors, zooms, target ID and beam angles as well. The more you play with these settings, the more Marcum LX 7 tips and tricks you will discover. You do not want to miss a Marcum LX7 update, whether you count the software or the maps. The fish finder does not have Ethernet connectivity. Fortunately, Marcum has incorporated USB ports. Whenever an update is released, you can download it on your computer and transfer it to the device. Most of the reviews claim on the manufacturer's dedication to updating the software on a regular basis. New updates come out every once in a while and the difference is visible right away. Given the latest upgrades, Marcum can now brag with one of the best horizontal graphs in this segment. Measuring 11 x 11 x 11.5 inches, this fish finder is one of the large models in its range. It weighs around 13 pounds – a bit difficult to carry, but easy if you put it in a backpack. It is manufactured in the USA and comes with a full package. It stands and has a nonslip bottom. Its design also includes padded softpacks. Apart from the transducer, power and frequency – three of the vital considerations in a fish finder, buyers are highly advised to pay attention to small details as well. For example, the GPS integration is critical. You might want to spend nothing and buy a cheap fish finder, but the lack of GPS will ruin your experience. Unless you fish around the shoreline only, a GPS is a must. What about the actual shape and style? A through-hull transducer is excellent to help you understand the environment. It comes with depth sensors, as well as small thermometers and paddle wheels. An in-hull transducer does not get in touch with the water. It can only be mounted on fiberglass, so your options are a bit limited. A transom-mount model is adjustable and allows multiple mounting possibilities. The installation is fairly simple too. Consider the price as well. The main considerations require more money. 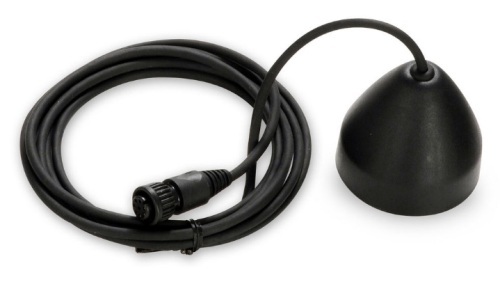 Ideally, you should buy the most powerful and solid transducer you can afford. The same rule applies to the screen – bigger is better. Bells and whistles could make your life easier, but make sure you can actually find a use for them or you are only wasting your money. 1. Can I use this fish finder for boat fishing? 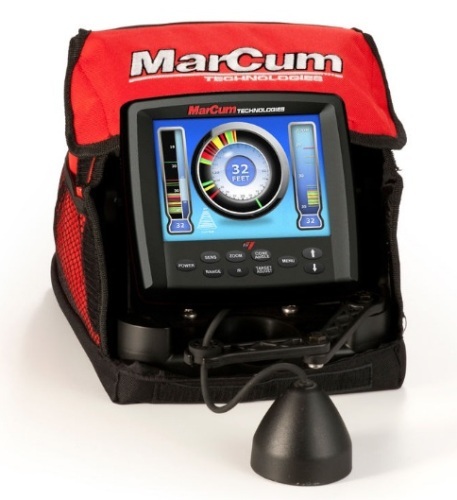 Marcum's LX-7 model has been designed for ice fishing. It does not use side imaging, which makes boat fishing inefficient. Sure, you can use it, but the results will not even compare to what a boat fishing finder can provide. If you are interested to spend more time boat fishing, you should opt for a different model. 2. What makes solar spacing so important? Solar spacing allows you to make the difference between two nearby. If one fish is close to a natural structure, you can tell right away. 3. What are my upgrading options? Given the fact that there is no Ethernet connectivity but just USB connectivity, this is your one and only option to install updates. ​Around 85% of all buyers find it exceptional. As for the negative comments, they usually come from beginners who simply do not have the patience to learn how the fish finder works. They are overwhelmed with the tech aspect, so they would rather give up – terrible mistake. We checked the so called negative reviews and tested this fish finder to identify any flaws. Based on our results, we rate this fish finder 4.7 out of 5 stars. It would have been 5 stars if it is also suitable for boat fishing.